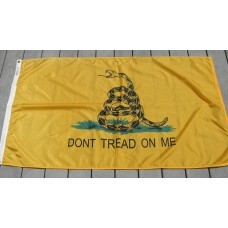 The Gadsden Flag is one of the most commonly requested, historical flags in the industry. These Gadsden Flags are accurate reproductions of the original flag, revealing a beautiful pattern and holding vibrant color. Made with 100% nylon, and finished with strong, canvas headers and brass grommets, the historical Gadsden Flag is a must have.